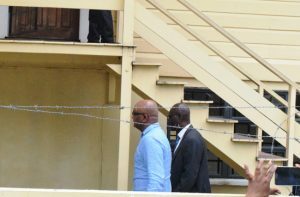 File photo: Former president, Bharrat Jagdeo after he was arrested and taken to SOCU in March 2017. Leader of the Justice For All Party, Jaipaul Sharma, has described as all hot air, the defence given for the building of the Pradoville 2 housing scheme. 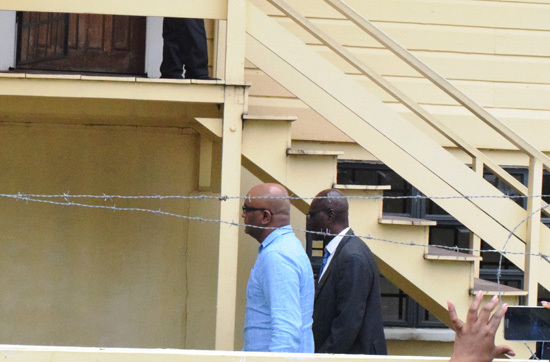 The scheme is the home of the several ex-ministers and former president, Bharrat Jagdeo. On Wednesday, former Public Works Minister, Robeson Benn, said that the decision to develop the scheme at Sparendaam, East Coast Demerara, was taken after it became apparent that the lives of top officials of the former president Bharrat Jagdeo administration were under threat. Benn pointed to the assassination of former Agriculture Minister, Satyadeow Sawh, in 2006. A number of his family members were also killed in the raid on the minister’s LBI, East Coast Demerara home. However, Sharma, who is also the Junior Minister of Finance, is not buying that explanation. The two former ministers were Priya Manickchand and Robert Persaud. Both did not live too long in their homes before selling them. Manickchand reportedly sold hers for $100M. “So if you are using that argument of security, this would discount it. There are many other reasons including the empty lots which were not developed that would fly in the face of what Mr. Benn is contending,” Sharma said. The Minister said that even Benn himself contradicts the security excuse. According to Sharma, the case is clear-cut and straightforward. Sharma said that it is apparent that the police officials are reading the Constitution, documenting Cabinet process, studying the forensic report and reading statements of Jagdeo and his former ministers. “The entire Cabinet is inextricably complicit in violation of a series of criminal statutory and common law provisions and principles. I am saying what the Jagdeo cabinet did with the over $1B value of Pradoville Two lands must constitute the most vulgar abuse of the laws of this land by a Government. It is criminal. Investigators of the police’s Special Organised Crime Unit (SOCU) would not be too impressed by Benn’s statement either. During the past few days, several former ministers were hauled in yet again to be questioned. This time, investigators are looking in another direction- to charge the entire Cabinet and Jagdeo. Questioned this week were Manickchand, Benn, Manzoor Nadir, Kellawan Lall, Dr. Bheri Ramsaran and Irfaan Ali. Reportedly, Robert Persaud, Dr. Jennifer Westford and Dr. Ashni Singh are out of the country. Sources said yesterday that SOCU’s investigators had problems locating Charles Ramson, the former Attorney General. They could not locate him at his office or home. The anger over the Pradoville 2 lands has been riling up the populace. Not only were the lands ordered to be transferred to CH&PA by Jagdeo and his Cabinet, but the plots of land were not opened to be sold to all Guyana in any transparent manner. Rather, the allottees were hand-picked with the transactions allegedly personally by former Housing Minister, Irfaan Ali. Jagdeo and his Cabinet not only used state resources to develop the almost 15-acres, but positioned himself to buy two acres. In the process, he paid three times less than what ordinary citizens in the Diamond and Grove Housing Schemes, East Bank Demerara, would have been required to dole out. Jagdeo reportedly paid $5M per acre, which works out at $114 per square foot; the ordinary man paid $317 per square foot for his plot. On it, he built an imposing mansion, complete with pool and a high fence to keep out the Atlantic Ocean- the same Atlantic Ocean he said was rising because of climate change. Remigrants paid more than ten times the price Jagdeo paid for the same size house lot. They paid $1,111 per square foot. The ordinary house lots for remigrants and citizens are not ocean front, but are located on East Bank and East Coast of Demerara, in what were abandoned cane fields.